Today I’d like to tell you about a tool called WeBiText, under development at the National Research Council of Canada. It is quite similar to Linguee, a review of which I posted last week – it searches a corpus and provides parallel extracts of translations. 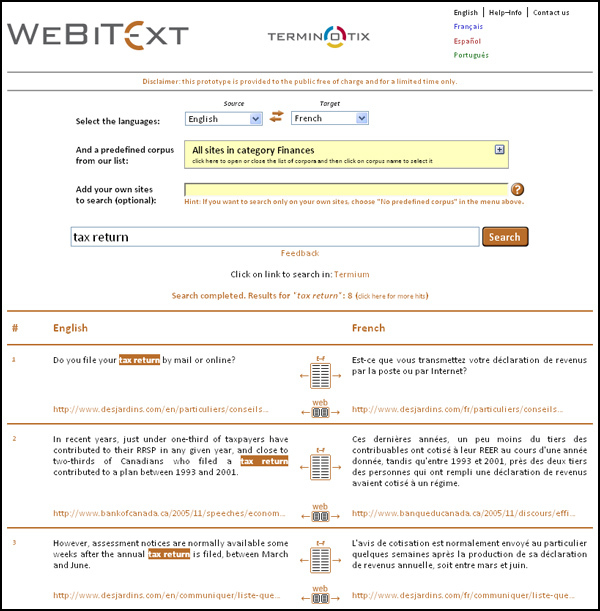 WeBiText can produce results for 30 languages, including a few unusual ones such as Inuktitut, Haitian Creole and Welsh. The above comparison is, of course, just an overview, and would depend on the language pair, subject field and term in question. Thanks for another great resource! Love it when you do reviews like this. Thanks to *you* Carolyn – appreciation makes it all worthwhile!! I too greatly appreciate this additional valuable resource and cannot thank you enough for this and all the other useful tips and information you provide. I follow this even on holiday! Thanks Juliette and keep up the good work! Hi, I actually was on vacation (in Miami, away from cold and wintry Montevideo) when I saw this post, and now that I am back, looking forward to spring in just 21 days – according to the calendar, at least – your summary brought it back to mind and I have added Webitext to my terminology resources. Actually I use Linguee all the time, and find it very useful, although sometimes the texts are way off from a correct translation, but it never fails to point me in the right direction. So, thanks a lot for your very thoughtful contributions! Hi Nelida! I do agree about ‘pointing in the right direction’. In the end, that seems to be what most resources can actually do for the experienced legal translator – contribute to giving us ideas rather than providing an ‘absolute truth’. Do you agree? Absolutely. Experienced legal (or otherwise) translators always know what they are looking for, and will immediately detect whether the offered solutions fit the bill or are off the mark. And more often than not, even a partial hit will steer you to where you want to go. Whereas, if you are not really a pro translator but a dabbler posing as one, no amount of resources can remedy that condition….